The Obama plan is a little better than I expected, but it still dances around an issue that is sacrilegious to many economists: Home prices are still way too high for any stabilization an/or housing bottom to form. While houses are not nearly as wildly over-priced as they were one or two years ago, they are still too high by most valuation metrics. Propping up home prices and the desperate attempt to forestall foreclosures only serve to delay this inevitable process. To effect a stabilization, housing bottom and recovery, overpriced assets need to fall even further. Notice that the States where home sales are increasing are those where we have sen enormous foreclosure surges (80-120%) and huge price decreases (40-50%). The major bubble areas — California, South Florida, Arizona, Las Vegas — have seen price collapse lead to an eventual sales surge. 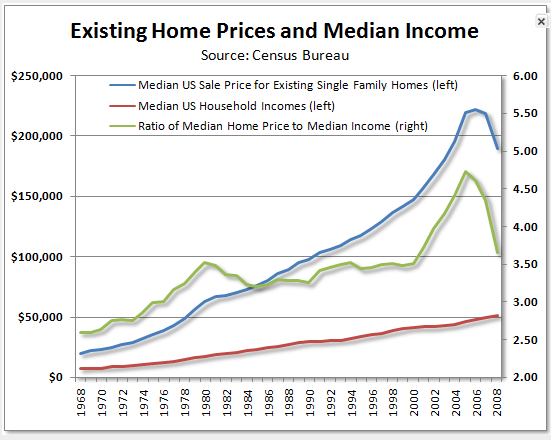 Why is it that prices are so important to the housing market? Real Estate is unique from most other goods and services, in that the purchase is not independent of other transactions. Buy 100 shares of stock, or a new or used car, or a can of soup, and only two parties are involved: The buyer and the seller. Buy a home, and you are likely involved in a long transaction chain with five, six or even more other buyers and sellers. A newlywed couple buys a starter home from a family (with another child on the way), who are moving to a bigger home, and whose seller is moving to an even nicer part of town, and so on. It is a long chain, not of mere lateral moves, but increases in size, cost (and property taxes). If any of those sales fall through, the entire chain collapses. Go to any suburban neighborhood — the one you or a freind/family member lives in. Look at the starter homes that a newlywed couple just starting out might consider. Small capes, 2/3 bedroom houses or cottages. Assume that this couple are late 20s/early 30s, and are making decent — but not 6 figure — salaries. Can they afford that starter house? If not, then the entire real estate chain is frozen. What’s left is mostly lateral moves, greatly reducing the overall sales. House sales peaked in 2007 at well over 7 million units. We are now running about 4.25 million sales. A more normalized number would be between 5 and 5.5 million. That’s not gonna happen if the starter home market is dead.